Travel by kayak, bicycle or take a leisurely hike to experience some of Andros coastal and inland flora and fauna. Guided or self-guided experiences are available upon request. Andros is the largest island in The Bahamas and provides the best hiking and cycling adventures! There are a few historical ruins on the island, several caves and the highest number of blue holes in the country!! Depending on where you are hiking or cycling, you may encounter the Andros rock iguana, land crabs, piping plovers, Bahama Orioles or the fabled chickcharney!! In addition to having the longest coastline in the country, the island of Andros has many inland blue holes, lagoons and mangrove creeks. This means you have safe, comfortable kayaking conditions year round despite the weather. Our kayak routes along the shorelines and wetland creeks are teeming with biodiversity. All equipment - paddles, backrests and life jackets - is provided. Bring your camera! The snorkeling in and around Andros is awesome!! 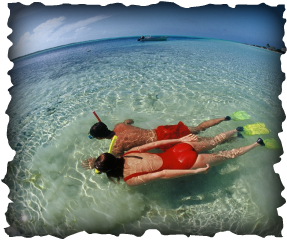 Aquamarine waters, the Andros barrier reef and hundreds of patch reefs make for an unforgettable snorkel experience. You won’t get tired of swimming along reef fish, majestic coral formations, sea turtles, stingrays and nurse sharks. Depending on your route you may even encounter stretches of shells, starfish, sand dollars and sea biscuits. A safe adventure for all snorkelers - we know the way!